NEW YORK – Pope Francis has been challenged to go vegan for Lent – and in exchange for his sacrifice, he’d receive a $1 million donation to a charity of his choice. The high-stakes deal is being offered by a 12-year-old animal rights activist, Genesis Butler, and the Million Dollar Vegan campaign. Earlier this week, an open letter was published appealing to the pope to abstain from all animal products during Lent, which is set to begin on March 6 for Catholics and will end at Easter. The letter makes a strong case that a vegan diet will yield dividends for the environment. In her letter, Butler also cited the pope’s 2015 encyclical “Laudato Si,’” wherein he calls for collective common action to fight environmental degradation. “In your encyclical letter, “Laudato Si,’” you stated that every effort to protect and improve our world will involve changes in lifestyle, production, and consumption. I agree with all my heart and seek your support in tackling one of the largest underlying causes of the problems we face: animal agriculture,” wrote Butler. Kirsten Powers, a CNN political analyst and USA Today columnist, who is a vegetarian, concurred with Misleh and told The Tablet she hopes the pope accepts the offer. 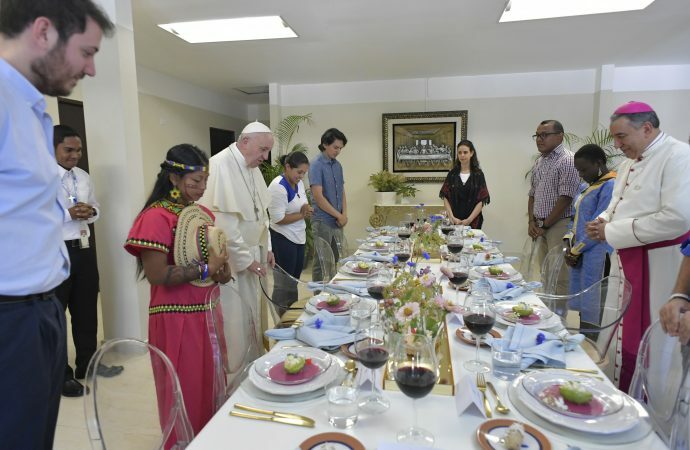 “I pray that Pope Francis will accept this challenge to raise awareness of the grave damage the consumption of animal products does to the environment,” she said. “A plant-based diet would also be better for the Holy Father’s health and for the animals that God has entrusted to the care of humans,” Powers continued. Such a dare may prove intimidating for the Argentine pontiff, where his native country’s beef is one of its national treasures. In 2016 Argentina ranked second in the world for per capita meat consumption, just behind neighboring Uruguay. Yet Fordham University theologian and author of the book For Love of Animals: Christian Ethics, Consistent Action Charles Camosy told The Tablet that there are three reasons he believes the pope should give it serious consideration. “First, it witnesses to the nonviolent world God intended as revealed at the end of Genesis 1 and the nonviolent Kingdom to come with the lamb will lay down with the lion and the baby by the cobra’s lair. Second, it would put it in solidarity with our Orthodox Christian brothers and sisters who basically go vegan during Lent. And third it would be an important witness to how consuming animal products contributes to the existential threat of global climate change,” he said. To date, the Vatican has not announced whether or not Pope Francis will accept the challenge. I don’t know, Jesus ate lamb! What will happen to the environment when deer and other animals over populate? It will change the eco-system. A vegan diet – they say it adds life to our lifespan.